The process of conjuring memory and seizing the past drives ODC Theater resident artist Amara Tabor-Smith’s creation of He Moved Swiftly. Having discussed personal collections of dance acquired through shared time and space with artists on the blog last week, Smith’s discussion about her project during UC Berkeley’s Dance Studies Working Group meeting expanded on the significance of one’s past. During her presentation, she braided Ed Mock’s influence into ways of moving forward through her current work. Tabor-Smith cites the word Sankofa, an Akan word of Ghana, meaning, “to go back and get it,” also associated with a proverb translated “It is not wrong to go back for that which you have forgotten.” Tabor-Smith thinks of Sankofa as “going back to move forward,” and also mentions “spiral time” (a term used in relation to performance by professor Leda Martins) in which the past and the future meet in the present. “This man is why I dance. He is largely forgotten.” comments Tabor-Smith. She considers herself a descendant, speaking of how dance captures the history of a body. Tabor-Smith began attending Mock’s studio on 32 Page Street at age 14. She remembers him as a storyteller who embodied jazz – a fearless improviser. “I was never as impacted by someone’s presence as when he walked into the room. I felt spirit embodied in him,” Tabor-Smith notes. She also describes Mock’s full commitment toward presence and improvisation as one of risking failure that comes with letting the idea move through the body. “People want you to take risks when you dance but they want it to be ‘good,’” she adds. Ed Mock. Photo by Lynne Redding. To declare what it means for a dance to “be good” reflects one’s taste as well as mediation of mass opinion and personal attitude, and Brian Phillip’s essay outlines the impossibility of answering that question. Tabor-Smith feels that Mock’s performances demonstrated a great range, keeping him from being located in any single identity. She mused about executing his fast footwork, screening a soft-shoe-influenced performance in which she and Wayne Hazzard performed. Tabor-Smith also spoke about his improvisations with Bobby McFerrin and Joanna Haigood. 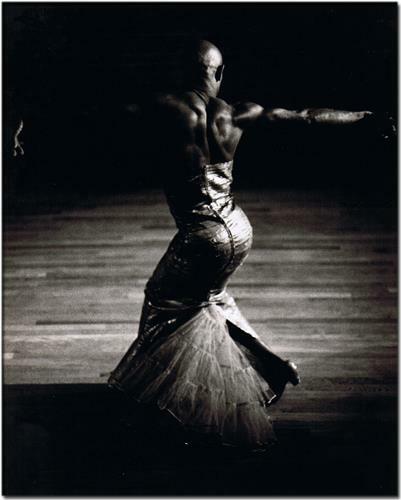 Mock was a contemporary of Alvin Ailey and studied Horton as well as Dunham technique and some Limon. He moved from Chicago to San Francisco in the 60s and worked with artists including Gloria Unti of Performing Arts Workshop, Anna Halprin and Terry Sendgraff. “Ed was always evolving; it always had to be new. This work is about conjuring Ed in a community that doesn’t know him anymore and about a time that doesn’t exist anymore in a changing city, and it’s about AIDS because that’s what he died of.” Therefore, in addition to conjuring, the work is about allowing grief. Tabor-Smith was 21 when Mock passed. She is now the age at which he died. Speaking to a culture in which we celebrate breaking new ground, Tabor-Smith stresses the importance of remembering where one receives his or her information, stating, “You get what you have from somewhere and somebody.” In conjunction with the new work, Smith is planning Carried in the Body: Dance Legacies Lost and Found, an evening discussing lineage with dance artists including Brenda Way, Joe Goode, Robert Moses, Sara Shelton Mann, Anna Halprin and Deborah Vaughnn on May 3 at YBCA at 6 pm. Who are your teachers? What are the threads composing your amalgamation? Yayoi Kambara in Triangulating Euclid. As an art conservator, Karen Zukor preserves and restores works on paper – one of those being a rare edition of Euclid’s Elements. 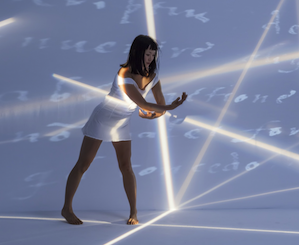 Her engagement with the book was a driving inspiration for ODC Dance’s new work, Triangulating Euclid, a collaboration between Brenda Way, KT Nelson and Kate Weare, in which Zukor’s voice is heard as part of the sound score. She spoke in person at ODC Unplugged February 15, discussing how works of art move through the hands of collector, curator and conservator, and listening to her in a dance studio, I couldn’t help but think about how time-based art such as dance, without a tactile objecthood, is collected. I think we are all collectors and will focus on that role in this post. While institutions, academia and individuals increasingly address collecting dance with attention to intellectual property and transactions surrounding rights to an ephemeral art form, anyone who encounters dance automatically becomes a sort of collector. All the dance you’ve seen composes your collection, and this collection is not about ownership but rather about shared time and space. Dance collecting through experience and memory is so deeply connected to place, as one’s collection runs parallel to movement through geographic locations. The collecting occurs unevenly, the remembered details becoming a patchwork of that to which we paid attention. On March 9, ODC Dance previewed Triangulating Euclid at the Center for the Arts in Middleton, CT. This week they’re back in the Bay performing the Dance Downtown season at the Lam Research Theater – the collection of ephemeral experiences tied to geographies in time. Since my “dance collecting” habit moved to San Francisco in 2009, I’ve explored some abundant aspects of dance made in this city by the Bay – maverick individuality, experimentation, culturally-specific, site and aerial work as well as queer performance. Recently returning from Wesleyan University’s Institute for Curatorial Practice in Performance (ICPP) in Connecticut (along with ODC Theater Director Christy Bolingbroke), Austin Forbord’s “Artists in Exile” rose to the top of my mind. During the film, Bay Area dance makers discuss their sense of place in this particular region, outside of New York City. While in Connecticut, despite globalization, proliferating communication channels, and touring, conversations about Bay Area artists came only from those of us who live in San Francisco, even in a room full of knowledgeable and passionate dance professionals gathered from across the country. This served as a reminder of how the transmission of knowledge about dance occurring outside the Big Apple still happens largely on the ground, person-to-person, one voice at a time. As transit to and from the East Coast highlights factors that differentiate disparate dance environments, I recognize the presence of the tech industry in the Bay Area as paramount and unlike any other place. Whether directly or indirectly, the density of tech companies and resulting concentration of economic, social and cultural capital impacts how dance makers live and work. More about dance artists and tech in a post to come, but in the meantime, read this essay by Rebecca Solnit, which stoked my alarm about the soulful vibrancy of San Francisco and volatile landscape for artists. So how can you, dear dance collector, help capture the history you experience? How, why and where are you collecting fragments of the ephemera? Encouraging an inclusive compilation of dance from the past fifty years, the Bureau for the Future of Choreography is in the process of crowdsourcing dance history. Organizer Moriah Evans describes the Flowchart Project as “A call to map the past fifty years of dance, choreography and performance history because a lot of that information is stored in the lives and bodies of the people who did those things, and it isn’t necessarily readily accessible yet, and it hasn’t been historicized yet.” Anyone can participate by sending a flowchart to dearBFC@gmail.com and if a few more people from San Francisco’s rich performance hub submit to the project, the dance history books of the future might include more voices from the West. I’ve got these nagging lines of inquiry forming spirals, zig-zags and arcs of varying lengths. Perhaps the most compelling and enduring line for me is curiosity around the stretchiness of time, which keeps me coming back to performance again and again. Live performance is a laboratory in which I can study this stretchiness composed of the conscious and unconscious, perception and experience, ephemerality and memory – all unfixed and immense. I occasionally think about this New Yorker article discussing the play of timing and the brain, employing percussionists as test subjects, claimed to be more attuned than most to exacting time. We are all test subjects when experiencing live performance. When I saw Episode One of Life and Times in January performed by the Nature Theater of Oklahoma my patience was tried and a three-hour performance at the Public Theater seemed interminable as the actors sang about the mundane details of one company member’s life. Stretchy time expanded. Alternately, at a recent concert by Sunn in San Francisco, the blaring stasis that rattled my jeans distilled time, my perception of the two hours seemingly more brief. Every performance speaks to the last work seen. Every piece also speaks to one’s life before walking into the theater. To visit the different planets of artists through performance is an experiment with time and a practice of presence. Nature Theater of Oklahoma performing Life and Times. Photo by Nature Theater of Oklahoma. Not only does the rare opportunity to experience the same work performed multiple times highlight how no two performances are ever the same, it also makes apparent the multifactorial nature of perception and how no two events can be experienced in the same way. Repeat watching exaggerates the variation, inconsistency and fallibility of perception. A few weeks ago, watching Early Plays performed by The Wooster Group and New York City Players both Thursday and Saturday at YBCA, I experienced the second performance to be much shorter based on my expectations and previous exposure. I was also less alert to nuance and detail the second time around. Time is important. It’s limited for all of us. I believe attention to live performance raises the potential of every moment because it tests our sensitivity and awareness. For that reason (among many) I love artists. They are philosophers in their own right and shape how we pay attention. And what is life about if not paying attention and noticing fiercely? As the Writer in Residence at the ODC Theater, I consider the people, processes and performances at the Dance Commons catalysts and informants for conversations about the potency of dance and how we frame the craft in relation to the Bay Area, arts across the nation, and, perhaps most importantly, to our globalized society and the questions of our time. Founder of Culturebot, Andy Horowitz defines contemporary work as that which involves inquiry or interrogation. I also think of these as guiding factors for the conversations to be had on this blog. Looking to emerge from that “twenty-four hour emergency zone”? Take the triple dog dare. Share your art adventures and dance thinking here. I’ll be embedded as the Writer in Residence at the ODC Theater throughout 2013. Let the juicy conversations begin. 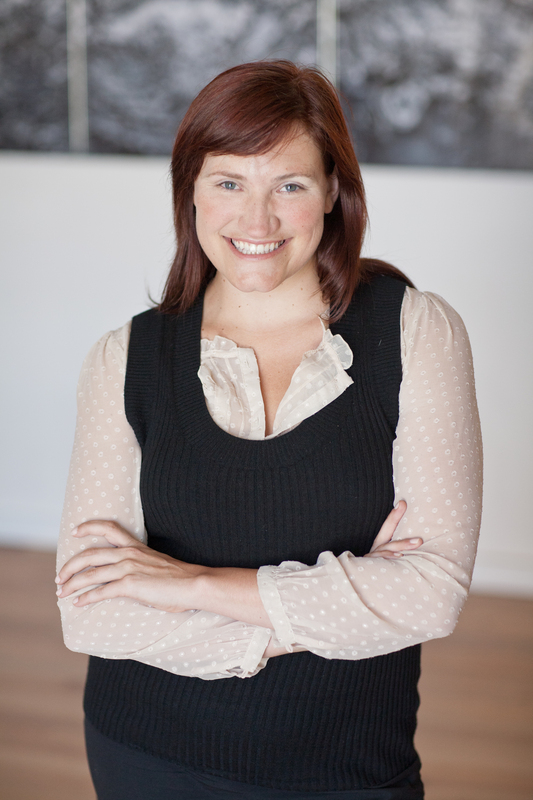 Christy Bolingbroke, ODC Theater Director. Photo by Meg Messina. Viewing many performances a year at our own space, around the Bay Area, and across the country, I consider myself lucky. I get to satisfy my omnivorous appetite for art and all these different experiences. I don’t expect masterpieces across the board. But each artist shows or gives me something that will inform how I see and how I watch my next show. This reminds me of a similar question that looms in the air at arts performances. So I say to both questions, art isn’t about defining meaning, but about sparking dialogue. Rather than just talk about the who, what, where, and when, with Julie Potter as our Writer in Residence, I’m excited to talk about the “how.” How does a dance artist make work? How does that work relate to artists making work elsewhere? How does dance inform or relate to everyday culture? How do we talk about dance – an artform that transcends words? And even if you aren’t fluent in dance, let your thinking find its way into our space. This is just as much a thinking space for you.